Schumacher Group Medical Billing was looking to drive change: denials were too high, collections were not being optimized, and workflows were overly manual. Working with GE Healthcare, they made significant progress within each area of the revenue cycle targeted for improvement. The Schumacher Group was able to reduce claim rejections and denials while improving eligibility verification and payment electronic posting. 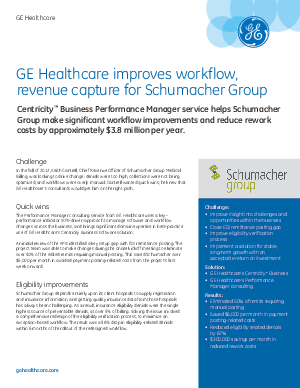 Ultimately, GE Healthcare was able to help the Schumacher Group make significant workflow improvements and reduce rework costs by approximately $3.8 million per year.